No one likes to hear from their partner that they couldn’t sleep through the night thanks to the amount of snoring they had to listen to, but a surprising number of people who snore never do anything about it. In a culture filled with instant fixes, we believe if something can’t be cured with a pill, injection, or an operation, then it can’t be cured at all. However, there are a number of ways to help lessen the impact on your life problem snoring can have. Some are simple and convenient, others are more complex and might even involve invasive surgery, but all of them have had some measure of success. One product in particular has been steadily growing in popularity as more and more people use it and realize its effectiveness. This product is the Good Night Anti Snoring Ring. The Good Night Anti Snoring Ring is a simple ring worn on the little finger. The snoring ring applies light pressure to two different acupressure points on the finger, stimulating the body’s natural healing abilities to help reduce - often stop altogether - the snoring. It’s safe and effective, which appeals to anyone with allergies, or an (understandable) aversion to unnecessary surgery. Scoff all you like about acupressure, but it's been part of traditional Chinese medicine for thousands of years, whereas conventional Western medicine dates back barely 200 years. Before the 19th Century, religion and medicine were closely linked, care of the sick a religious duty and in the 13th and 14th centuries, healing shrines, sacred relics were considered medical treatment and any hospitals built in Europe were mainly religious foundations. Good luck finding a successful snoring cure courtesy of Western medicine anytime in the 19th Century. 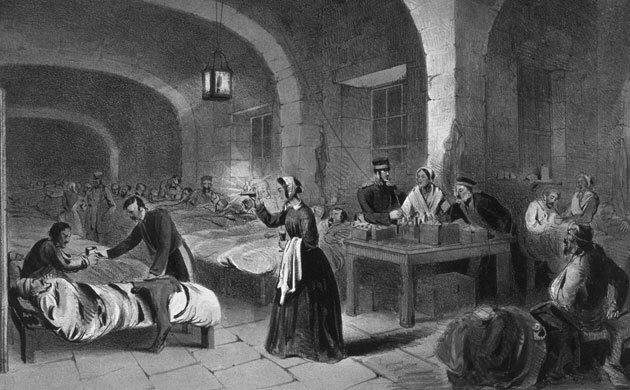 Here, Florence Nightingale (1820 to 1910) tends to victims of the Crimean War. This anti-snoring ring is also supremely discreet. Unlike the horrific masks or ridiculous oral appliances some people expect you to try; your partner won’t know you’re wearing anything other than a normal ring. If you want to stop snoring naturally without drugs, medicines or awkward oral appliances, the Good Night Anti Snoring Ring is surprisingly affordable, has a no-risk guarantee, which means if it doesn't work for you, return it for a full refund. But, above all, it can help you stop snoring so that you and your partner get a good night’s sleep.